Although the sharply jumping coal price has brought a wave of fresh air into current perceptions about Indonesia's coal mining industry (reflected by rising shares of coal miners listed on the Indonesia Stock Exchange), we should not become too enthusiastic as the surging price is not so much caused by rising global demand but by declining global supply. The main reason why coal prices soared since mid-2016 is China's decision to slash coal production. Chinese authorities cut working days on coal mines from 330 days to 276 days in April 2016 in an effort order to remove excess capacity from the industry. This move should boost earnings for domestic coal miners and therefore this sector will not continue to be a burden on China's financial system (for example recently rising non-performing loans in China's banking sector). China also plans to close 1,000 coal mines this year and will likely, eventually (perhaps in the next five years), cut 500 million to 700 million tons of capacity from its overall annual production of about 3.6 billion tons. In 2015 China produced 3.68 billion tons of coal, down 3.5 percent from China's coal output one year earlier. This year, coal production in the world's second-largest economy is expected to decline by 4.2 percent (y/y). The key question therefore is: "how long will China remain committed to this policy?" In case China would decide to add coal production capacity in order to take advantage of current coal prices the recent aggressive upswing could possibly swing the other way. Meanwhile, Mike Evans, analyst at stockbroker Curran and Co, advises investors to be aware of the difference in coking coal and thermal coal producers: while coking coal is needed for steel, coal is not needed for electricity. Many regard thermal coal as dead or - at least - dying and therefore investors remain cautious (as well as the emergence of renewable energy sources). Supriatna Suhala, Executive Director of the Indonesian Coal Mining Association (or APBI), informed the production cuts in key coal-producing countries have now led to a shortage of 100 million tons of coal, hence we saw the soaring HBA price this November. Sumala added a coal price around USD $80 per metric ton is a price that is economically viable for the coal industry. Meanwhile, the smaller Indonesian coal miners that ceased production over the past two years due to low coal prices are not expected to suddenly restart the production process. Sumala believes it will require six more months before they can produce again. For coal prices this is a good thing. Limited supply should support coal prices well into the first half of 2017 provided China will not suddenly adjust its coal mining policies. Last year Indonesia produced 451 million tons of coal. This year output is expected to decline. Up to August the nation's coal miners only produced a total of 294 million tons of coal, achieving about 70 percent of the government's coal production target set for this year (419 million tons). Although Indonesia's domestic consumption of coal remains rather insignificant (compared to exports), domestic consumption is expected to rise starting from 2018 on the back of new coal-fired power plants under the central government's 35,000 MW program. 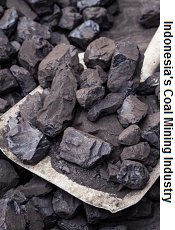 APBI expects Indonesia's domestic coal demand to rise to 177.5 million tons (per year) by 2020.